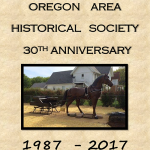 The purpose of the Oregon Area Historical Society shall be to preserve, advance, and disseminate knowledge of the history of the Oregon area. 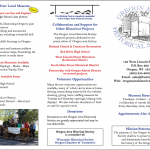 The Oregon Area Historical Society was chartered in 1987, the inspiration of a group of local residents who shared an interest in preserving and sharing the history of Oregon and the surrounding area. Establishing and housing a potential museum was a goal of the charter members. When the Oregon Lumber Company building on West Lincoln Street became available, it was purchased and donated by Florice Paulson in memory of her parents and grandparents. Dedication of the museum was held on May 18, 1991–the year of Oregon’s 150th birthday. The museum opened in October, 1992, while work was still in progress.